This page displays Michael Phillips’s reproduction of the poem “Introduction,” which serves as the introduction to William Blake’s best known collection of poems, Songs of Innocence and of Experience, specifically in this case to the Songs of Innocence. Follow the link to read about the Songs as a collection. Phillips’s reproduction was displayed in the Blake in the Heartland exhibit at Tiffin University, which ran March-April 2015. The the shepherd described in the “Introduction” to the Songs of Innocence is pictured in the Frontispiece drawing, where he is shown at the moment of inspiration. 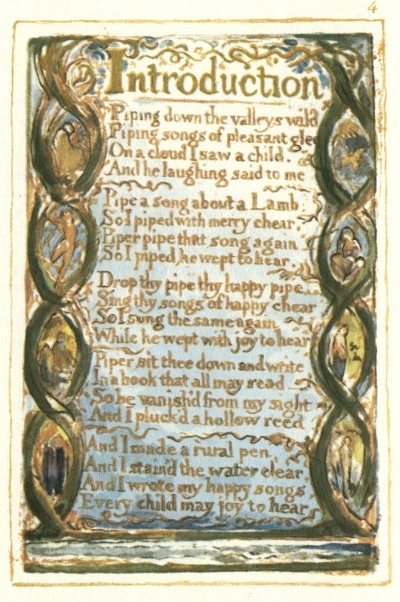 He is talking to a child (a muse or cherub) in a cloud who is asking him to pipe, and then sing, and then write “a song about a lamb.” The pastoral setting for this poem establishes the tone for the Songs of Innocence as a group; the shepherd’s lambs are behind him while he himself is framed by trees. The “Introduction” plate itself frames the poetic text between entwining vines in which are pictured several images. Michael Phillips’s reproduction follows, and it is then followed by Robert McFate’s response piece, Introduction. 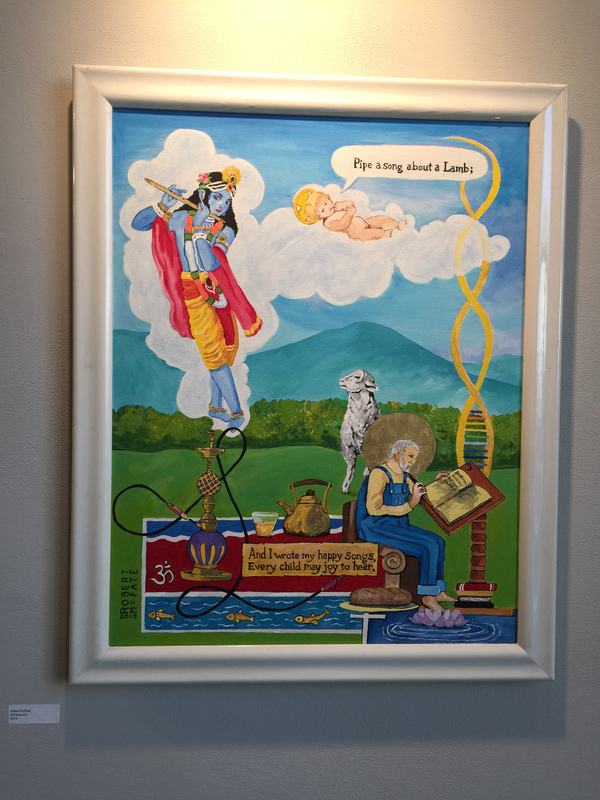 McFate’s work similarly pictures a poet writing as he is being inspired by a child in a cloud, but the entwining vines of Blake’s original become DNA strands in McFate’s response, while behind the farmer-poet is a Hindu deity piping a song as well. The deities’ placement in the cloud makes him a source of inspiration as well. Blake was aware of Hindu mythology, which had just started to become known in England in the eighteenth century, so this depiction is not as foreign as it may seem. In what ways do these differences comment on Blake’s original and on the nature of artistic inspiration today? Blake’s originals taken from Wikimedia Commons. See a list of all available copies of the Songs, with the ability to view different copies of the same page side by side, at The William Blake Archive, which also provides transcriptions of and annotations for each individual plate. 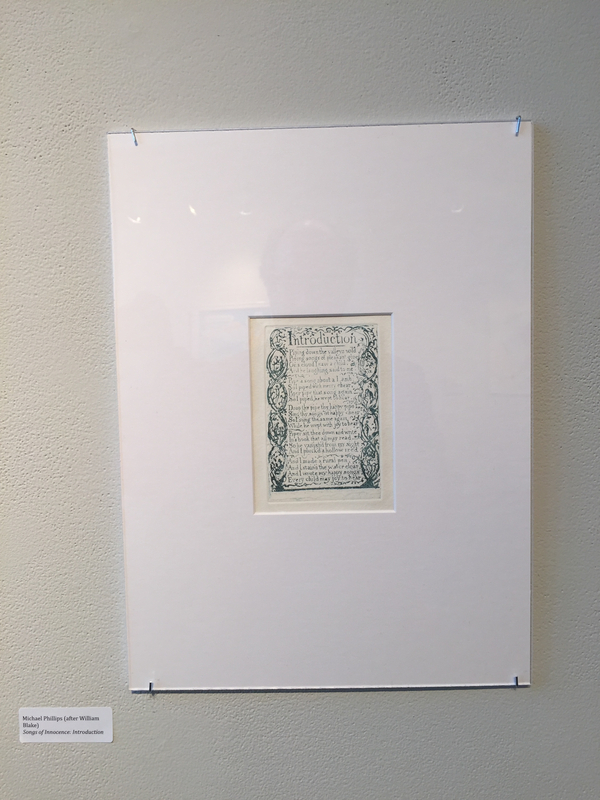 You can also read David Erdman’s edition of the Songs at The Blake Digital Text Project. Images of Michael Phillips’s reproductions by permission. Click on the images to enlarge. Michael Phillips’s reproduction of “Introduction,” Songs of Innocence.